You’re a Good Man, Charlie Brown opens at Jean’s Playhouse on Wednesday, August 23rd, at 7:30m. Performances run until September 9th with shows on Tuesday, Thursday, Friday and Saturday evenings at 7:30 and Wednesday Matinee’s at 2pm. Be sure to Join us on Wednesday, August, 30th for a talk back with the actors and members of the production team following our 2pm Matinee! We hope to see you soon! Come join us this fall for Six Dance Lessons in Six Weeks, playing September 21-30. An aging but formidable retiree hires an acerbic dance instructor to give her lessons in her condo in St. Petersburg Beach, Florida. Antagonism between the gay man and the wife of a Southern Baptist minister gives way to profound compatibility as they swing dance, tango, foxtrot and cha-cha. And rounding out our 31st professional main stage theatre season is I and You, playing October 5-14. Anthony arrives unexpectedly at his classmate Caroline’s door with a beat-up copy of Walt Whitman’s Leaves of Grass and an urgent assignment from their English teacher. Homebound due to illness, Caroline hasn’t been to school in months, but she is quick and sardonic, at odds with Anthony, who is athletic, sensitive and popular. 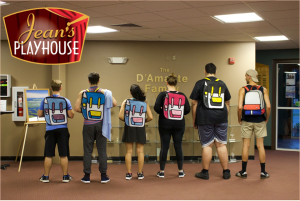 Attached Photo Caption: Cast members show off their CHARLIE BROWN backpacks at Jean’s Playhouse!